Match races have seen some of the greatest thoroughbreds in history pitched against each other, and the competitors are still honoured hundreds of years later. Newmarket, with its four mile long Beacon Course, was the site of many significant clashes in the 18th and 19th Centuries. One of the most famous matches was the 1799 race between Hambletonian and Diamond, a duel that represented a clash between north and south. Hambletonian, a son of King Fergus, was foaled in 1792 and won eighteen of nineteen stars including the 1795 St Leger and two renewals of the Doncaster Cup. His contemporary Diamond, a strong compact horse by Highflyer, won nineteen races in all, with many of his successes coming over Newmarket heath. The race was one of the most anticipated in turf history, and many northern racing fans travelled down from Yorkshire to watch their hero Hambletonian face Newmarket’s champion. The match was run between 1pm and 2pm on the 25th March over a distance of 4 miles 1 furlong 138yards. The race was worth 3000 guineas (an incredible amount for the time), and between 200,000 and 300,000 guineas was wagered on the result. Leading jockey Frank Buckle was on Hambletonian, who carried 8st 3lbs, while Dennis Fitzpatrick rode Diamond with a 3lb weight break. Tactics were key in the race, and Buckle let Hambletonian stride on from the ditch to compensate for Diamond’s excellent pace up the hill. It was a truly head to head match in the last half mile, before Buckle’s determination saw Hambletonian cross the line a neck in front. Both horses were exhausted and bloodied from the spur from their efforts, as depicted in George Strubbs famous painting, Hambletonian Rubbing Down. His work showed the true cost of hard riding, and may have been a factor in improvements to the treatment of racehorses. Over fifty years later, it was York’s turn to host the greatest match race of the century: the clash between The Flying Dutchman and Voltigeur. The former, a small dark brown colt by Bay Middleton, had lots of speed but stayed a distance, as evidenced by his unbeaten juvenile campaign, and easy victories in the Derby, St Leger and Ascot Gold Cup. Voltigeur was a year younger than The Flying Dutchman, but also won the Derby and and St Leger in 1950. A compact, muscular horse by Voltaire, Voltigeur inflicted the only defeat suffered by The Flying Dutchman in the 1950 Doncaster Cup. In receipt of 19lbs from his older rival, and under a brilliant ride from jockey Nat Flatman, Voltigeur stayed on to upset the champion by half a length. The aftermath of the race saw The Flying Dutchman’s owner the Earl of Eglinton demand a rematch to restore his horse’s reputation. He maintained that jockey Charles Marlow had lost the race through being overconfident and perhaps even inebriated. The second bout was set for 31st May 1951 at York over a distance of two miles, and for a prize of 1,000 guineas. Jockey Club handicapper Admiral Rous set the weights, with The Flying Dutchman carrying 120.5lbs and Voltigeur 112lbs. As both horses were tremendously popular, the match was met with great excitement, and an enormous crowd of 100,000 race fans swarmed onto the Knavesmire. On the heavy going, Voltigeur took the lead under Flatman while The Flying Dutchman, who disliked soft ground, waited in behind. The match developed into a bitter struggle for the lead and, to the delight of the crowd, The Flying Dutchman inched his way past Voltigeur to triumph by a length. One of the more unusual match races was between Eleanor and Eagle at Newmarket on the 31st October 1804. Eleanor was one of the great racemares of the era, one of only six fillies to win the Derby and the first to also win the Oaks. Before her races at Epsom, the story goes that her dying trainer uttered to a clergyman, ‘Depend on it, that Eleanor is a hell of a mare’. Her opponent Eagle was a full brother to Derby winner Spread Eagle (the only horse to defeat Hambletonian), and reckoned the finest horse in England. He ran exclusively at Newmarket and won many valuable races and matches. The race against Eleanor was shortened to five furlongs as Eagle suffered from breathing problems by this stage. This gave him an advantage over the mare, who stayed four miles, although in compensation she received a 19lbs weight break from Eagle. With Frank Buckle riding, Eagle defeated the gallant Eleanor by a neck, as depicted in the painting by John Whessell, which is displayed in the Museum galleries. Some match races have been less prestigious and more puzzling. In Lincoln in 1744 on an otherwise dull Thursday night, a six year old and a twenty one year old horse were pitted against other over 14 miles, to immense betting interest. 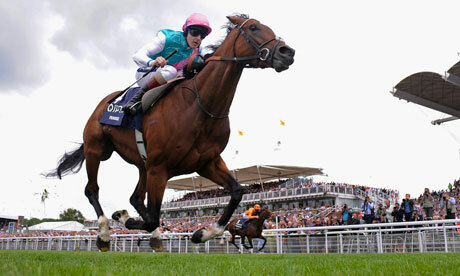 The race took 39 minutes to be run, but in the end the younger horse triumphed by a length. Although match races remained popular in the USA up until the 1970s, they declined in prominence as a sporting event in Britain. Nowadays, top class horses are expected to face each other in full and competitive fields, although de facto matches can still occur. In the last few years, a great deal of publicity has surrounded the clashes between Denman and Kauto Star in the Cheltenham Gold Cup, and Canford Cliffs and Frankel in the Sussex Stakes aka ‘The Duel on the Downs’. Both races featured an extended cast, but little mattered except for the two protagonists and, in the spirit of the great match races of the past, both races will be remembered for years to come.